When doing regular maintenance on your yacht – more so whilst a proper refit as I am doing right now with my sailing vessel (you may read a full article on that topic here) grinding and thus producing a lot of dust in inevitable. That is a lesson I`ve had to learn lately when I was grinding off the remainders of the decking glue with an angle grinder. Less dust but more worrying particles will come off your yacht every spring when you´d grind off the old antifouling-coating. I was lightened what to do at the latest when I was coughing up an icky yellow slime-bulb into my hands as I was taking a shower right after work being back at home again: Though the vibrissae are apparently filtering a lot of dust, a lot more would have passed the nose and went down into my lungs. Not a very pleasing picture. Health Hazard Fine Dust and Yachting. Wearing some kind of protecting gear during grinding or other dust producing works as well as during varnishing (especially by applying paint with a spraying pistol) should be mandatory and come as a matter of course. Because all the dust we are going to produce during a yacht refit or maintenance shouldn´t be considered healthy: GRP is glass reinforced plastic, hardened by epoxy resin, coated with other artificial materials and varnishes and painted, glued together, re-worked with body-fillers, silicone-based sealing and other chemical stuff. Unless you own a wooden yacht nearly everything your beloved boat is made of will be artificial. All this material will be grinded down to tiny dust particles and this hazardous mixture – if not instantly deadly – can cause everything from an annoying coughing-attack to some serious stuff happening deep, deep down in your lungs. 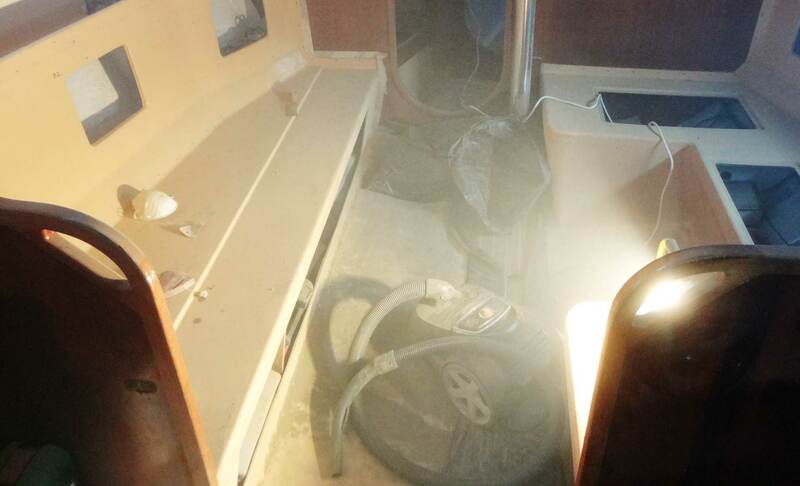 Dangerous dust: Boat builders and yacht refitters be aware! 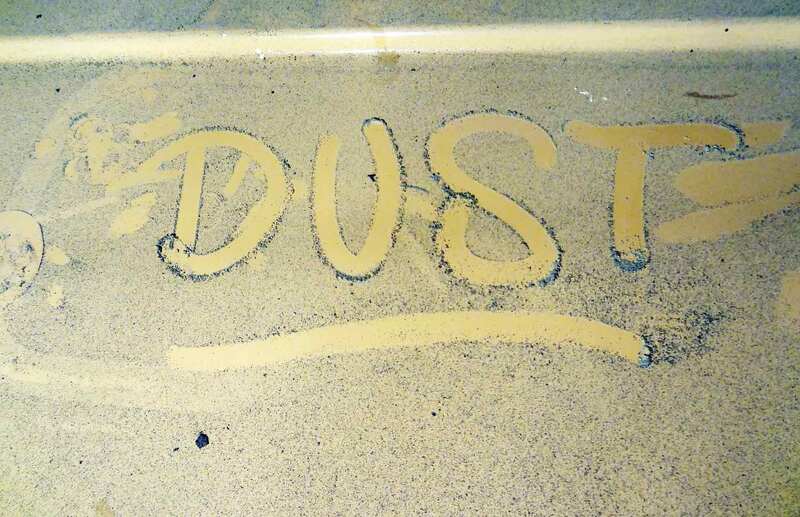 It is commonly known that fine dust – made of these kind of chemical and aggressive materials – can cause lung cancer and other severe damages to your health. The whole menu of horror stories can come true. If not – lucky you – even coughing up these handfuls of yellow slime and a taste of gelcoat in your mouth for days is a terrible thing. So, you may propagate the “fresh air and freedom that comes naturally with sailing” as long as you want, anyone who is at the same time still not wearing a breathing mask during grinding or paint-works will receive his bill. The one way or the other. Which Kind of Breathing Mask to choose? In general there are two kinds of masks available: breathing masks and respirators. A breathing mask will protect your lungs from particles and fine dust. It´s ideal for grinding stuff. But they won´t build up a barrier against aerosols and fumes. If you do a paint job for example you should go for the safer choice: The respiratory mask. They offer a convenient protection by utilizing different filtering systems against toxic aerosols which will be created during laminating or painting. 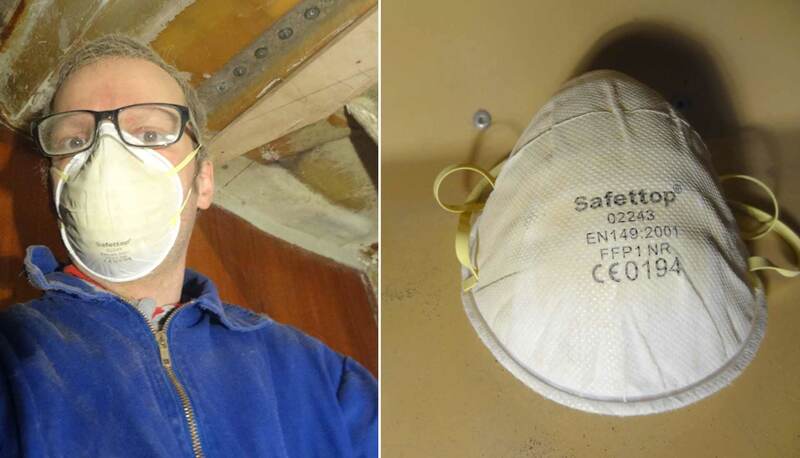 Since I find this topic rather interesting and we as boat owners are confronted with hazardous materials all over the place when working on our ships, I´ve decided to check out some respiratory masks. The market is sheer unmanageable. To have a quick and easy approach, I do order one mask of each system online. Only days later the parcel man delivers a package. On the one hand I went for a cheap offer. It´s the most basic of all masks – the Safettop FFP1 comes as five masks and costs from 3 to 5 €. That’s under one Euro per mask. My second package is a respiratory mask, a 3M model 6002C with a hefty price tag: 40 €. And that´s not even the upper class. My test will be as easy as this: Next time I went to work on my boat I put on each of the masks for some 30 minutes of heavy duty grinding – rests of glue and GRP produce a load of dust. The result should be simple: Which mask helps me most to breathe clean air? Is there any hindrance connected to wearing this mask? To put it simple: Does the mask do its job? A foreclosure: Both masks did a good job. When I was back home after this hard working day I didn’t sneeze up anything under the shower. I start my working day with the Safettop breathing mask. You know these things: They are made of a simple cardboardish material, resembling a negative of the nose-mouth-section of a face. You just simply pull them over and arrest the mask with two rubber-bands over the back of your head. That´s it. My mask-model offered an additional device for adjustment: A metallic clamp just on the back of one´s nose. By pushing the clamp over the nose one could tighten the mask. At the inside a foam-made little barrier would block off dust that could seep through over bumps in that area. A simple yet clever and surprisingly efficient system. Plus: Utilization of this mask is easy-peasy. It brings barely a weight onto your nose and it will fit reasonably tight over mouth and nose. Minus: The rubber straps come in at one length. There is no way in loosening or lengthening the bands (I am referring just to my tested model). If you´d have a small or big head you may feel the mask fitting too tight or too loose. 30 minutes of heavy duty grinding work later: How did the mask perform? Well. I don´t have to cough. That´s definitely a progress to not wearing a mask at all. I don’t feel like much of the dust has been able to break the barrier. I cannot detect dust at the inside of the mask. Even down at the area around the throat where I´ve had the feeling of having a large gap between my skin and the mask I could not see any particles. So far so good. What was really annoying: When breathing out my hot breath left the mask at the upper side, condensing right there at the insides of my glasses making me almost blind every minute or so. That really kept me off a quick work because I´ve had to clean the glasses all the time. But anyway: Protection was efficient as far as I can judge. The 3M respiratory mask is a burner. Unpacking the mask and being able to put the different parts together takes some minutes. My model is made especially for all kinds of work producing harmful odors like spraying pistols will do. This feels like a first class-product, not a cheap product for one time usage. First I have to apply the sealed fine dust filters into a casing which itself has to be screwed into the mask itself to the left and the right. Over these filters two additional coarse filters will be attached. Then I can put on the respirator. Plus: It´s a multiple use-product. You will change the filters from time to time and thus the mask can remain used theoretically indefinite. I really like the adjustable straps – a clever system of three different spots where to go for the perfect fit of the mask. Therefore this respirator should be usable perfectly by all types of heads. Minus: Honestly. There isn´t a single one I was able to detect. The respiratory mask performs just marvellous! Again, I went down on my knees and finished grinding off the whole inner decking of my yacht, again creating a thick, unbreathable atmosphere just like future astronauts can expect to be confronted with during a hazardous Marsian sandstorm. Mine was made of fine gelcoat-epoxy-glassfibre-dust. I even had to stop grinding two times to give the thick swath a chance to settle a bit to vacuum clean the most of it instantly. To be honest: This mask really is a burner! When the one-way breathing mask did leave me with a slight taste of GRP on my mouth, this respiratory mask even in the thickest vapor didn´t let come through anything at all! It was just a surreal feeling to squat down there in the midst of a thick dust cloud and breathe – well – clean air. Just a few centimeters of sight and I was breathing like I was standing at the ocean front in Habana. That is a bit WOW indeed. Well, to be honest, a mask like this is a bit oversized for most work we do on our yachts, but … you shouldn´t mess with your lungs. Wearing breathing masks should indeed be mandatory, tools like them should be standard equipment for every yacht owner. They do offer a good protection against aggressive dust particles as well as poisonous fumes. Even cheap one-way masks can be a very effective asset. Especially when it comes to grinding off antifouling every spring a yacht owner shouldn´t abstain from wearing one. Their slight hindrance of sight (I am a spectacle wearer) is justifiable. The disposable one-way mask is – from my point of view – something you can wear when working outside and with non-toxic stuff. For interior works or when no or poor ventilation is standard you should invest in a respiratory mask as shown. It´s getting dusty inside my yacht: Yacht refit is just a grinding business. The 3M 6002C is a wonderful product. It is re-usable and offers two barriers instead of just one. It can filter poisonous stuff as well as particles and fine dust by offering a full spectrum of adjustment options creating a fantastic wearing comfort. It is certainly not a cheap buy. But a maximum of safety for your lungs should be worth it. Cross your Heart: Are you working with a breathing mask or respiratory mask? I am looking forward to your comments. 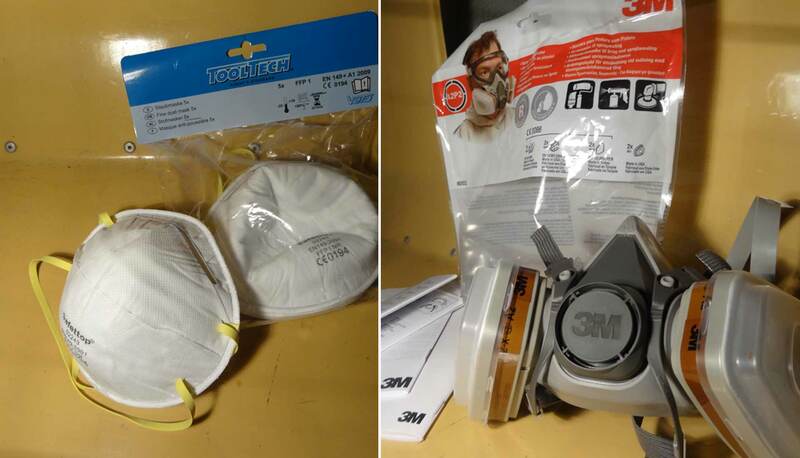 I have been using the 3M 6800 full face mask respirator and I love it! 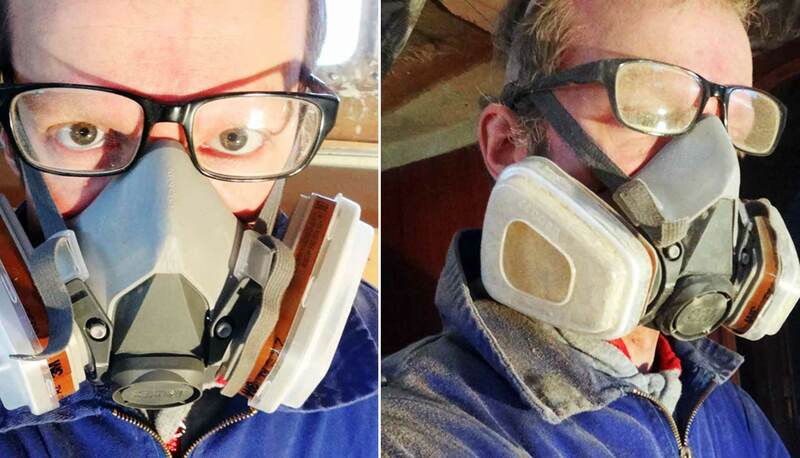 Whatever you do, grinding, sanding, painting, it offers your lungs and eyes 100% protection. thx for commenting. that mask really delivers.